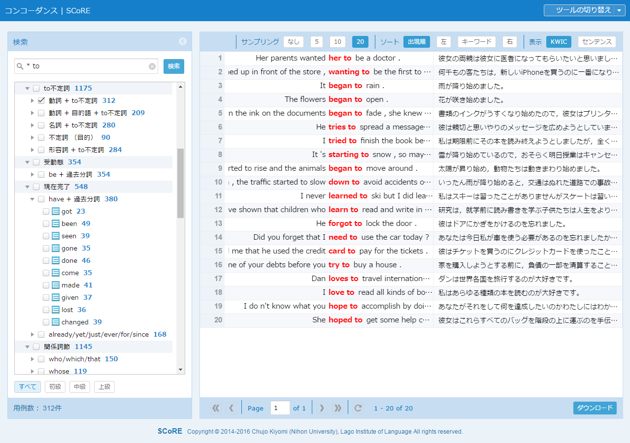 Chujo, K., Oghigian, K. and Akasegawa, S. “A corpus and grammatical browsing system for remedial EFL learners,” In A. Leńko-Szymańska and A. Boulton (eds. ), Multiple Affordances of Language Corpora for Data-driven Learning. Amsterdam: John Benjamins, 2015, 109-128. A Corpus and Grammatical Browsing System for Remedial EFL Learners (Kiyomi Chujo, Kathryn Oghigian, Shiro Akasegawa) 平成27年4 月 (2015) Multiple Affordances of Language Corpora for Data-driven Learning, in Agnieszka Leńko-Szymańska & Alex Boulton (Eds.) John Benjamins Publishing Company: Amsterdam, pp. 109-128. WebSCoRE: Effective and Enjoyable for Beginner Level Remedial Grammar (Kiyomi Chujo) 平成30年3月28日(2018) The 2018 TESOL International Convention, Chicago, Illinois. DDL（データ駆動型学習）を利用したアクティブ・ラーニング型の授業実践の試み（中條清美） 平成29年6月24日（2017） 日本大学生産工学部 平成29年度FD・SD研修会 平成28年度教育貢献賞受賞講演 講演概要 pp. 16-17. DDL（データ駆動型学習）を利用した学び直しを含むアクティブ・ラーニング型の授業方法の工夫（中條清美） 平成28年6月11日（2016） 日本大学生産工学部・日本大学大学院生産工学研究科 平成28年度FD・SD研修会 平成27年度教育貢献賞受賞講演 講演概要 pp. 16-17. An Effective Bilingual Sentence Corpus for Low Proficiency EFL Learners（Kiyomi Chujo）平成29年3月22日（2017）The 2017 TESOL International Convention, Seattle Convention Center, Washington. 英語教師と学習者のための教育用例文コーパスSCoREの公開（中條清美，西垣知佳子） 平成28年3月6日(2016) 言語教育エキスポ2016予稿集, pp. 66-67. Modifying Corpora Authenticity to Benefit Beginner Level EFL Students: An Update on SCoRE (Kiyomi Chujo, Kathryn Oghigian, and Shiro Akasegawa) 平成28年7月20-23日(2016) 12th TaLC Conference in Giessen, Germany. Modified Authenticity: A Sentence Corpus and Grammar Search Tool for L2 Beginners (Kiyomi Chujo and Kathryn Oghigian) 平成27年12月11日(2015) The 19th Joint Workshop on Linguistics and Language Processing: Data-Driven Language Learning and Language Learning Data, Waseda University, Japan. A Remedial English Corpus Browsing System for Beginner Level L2 Teachers and Students (※Kiyomi Chujo, ※Chikako Nishigaki, Kathryn Oghigian, Shiro Akasegawa) 平成26年8月11日(2014) AILA World Congress 2014, Brisbane's Convention Centre, Brisbane, Australia, p.153. 携帯端末で利用するWebSCoREの英語授業におけるユーザビリティ（中條清美，濱田彰，アントニ・ローレンス） 平成29年6月20日(2017) 日本大学生産工学部研究報告B， 第50巻，pp. 1-12. Data-Driven Learning of Word and Phrase Usage by Low Proficiency EFL Learners Using WebSCoRE（Kiyomi Chujo, Laurence Anthony, and Kathryn Oghigian）平成28年9月13日（2016）Vocab@Tokyo, International Conference on Vocabulary Learning and Teaching, Meiji Gakuin University, Tokyo, Japan. レキシカル・プロファイリング型オンラインコーパス検索ツールLWP for ParaNewsの英語授業における利用(中條清美，西垣知佳子，赤瀬川史朗，内山将夫) 平成27年6月20日(2015) 日本大学生産工学部研究報告B， 第48巻，pp. 45-57. Combining Two Corpus Tools for Easier & Effective DDL (Kiyomi Chujo, Laurence Anthony, Shiro Akasegawa, Kathryn Oghigian) 平成26年7月22日(2014) The 11th Teaching and Language Corpora Conference (TaLC), Abstract Book, Lancaster, UK., pp.94-95. Data-Driven Learning Using Two Freeware Bilingual Concordancers in the EFL Classroom (Kiyomi Chujo and Kathryn Oghigian) 平成26年10月24日(2014) The Seventh International Conference on English Language Teaching in China, Nanjing University, Nanjing, China. L2 Data-Driven Learning with a Free Web-Based Bilingual Concordancer (Chikako Nishigaki, Kiyomi Chujo) 平成26年1月7日(2014) The 12th Annual Hawaii International Conference on Education, Waikiki Beach Marriott Resort & Spa / Hilton Waikiki Beach Hotel, Honolulu, Hawaii, USA. A DDL Approach to Remedial Grammar Using the AntPConc Parallel Concordancer (※Kiyomi Chujo, ※Chikako Nishigaki, Kathryn Oghigian) 平成25年10月28日(2013) The 11th Asia TEFL International Conference, Ateneo de Manila University, Philippines. 多言語検索ツールAntPConcを利用したリメディアル文法授業の実践 （中條清美, 西垣知佳子） 平成25年8月9日（2013） 外国語教育メディア学会（LET）第53回全国研究大会，文京学院大学. Comparing Computer-based and Paper-based DDL in the Beginner Level L2 Classroom (Kiyomi Chujo, Kathryn Oghigian, Asako Uchibori) 平成25年6月20日(2013) 日本大学生産工学部研究報告B， 第46巻，pp. 1-11. 運用力と文法力を育む英語授業－コミュニカティブ教授法とデータ駆動型学習－（西垣知佳子，中條清美，小山義徳，神谷昇，安部朋世） 平成28年3月1日(2016) 千葉大学教育学部研究紀要， 64巻，pp. 138-144. 中学校英語授業における「言葉を観察する眼」を育てるデータ駆動型学習の実践－ペーパー版DDLからタブレット版DDLへの発展－（西垣知佳子，横田梓，小山義徳，神谷昇，中條清美） 平成27年3月1日(2015) 千葉大学教育学部研究紀要， 63巻，pp. 349-355. 中学生のための英語のデータ駆動型学習の実践と成果（西垣知佳子，國兼朝子，吉田壮一，眞田のり子，中條清美） 平成26年2月28日(2014) 千葉大学教育学部研究紀要， 62巻，pp. 345-353. L2 Data-Driven Learning with a Free Web-Based Bilingual Concordancer (※Chikako Nishigaki, ※Kiyomi Chujo) 平成26年1月7日(2014) The Proceedings of the 12th Annual Hawaii International Conference on Education, Vol. 12, 806-817, Waikiki Beach Marriott Resort & Spa / Hilton Waikiki Beach Hotel, Honolulu, Hawaii, USA. Comparing DDL and Non-DDL for Different Student Learning Styles (Kiyomi Chujo, Atsushi Mizumoto, Kathryn Oghigian, Laurence Anthony, Chikako Nishigaki) 平成26年9月28日(2014) American Association for Corpus Linguistics, Northern Arizona University, Flagstaff, Arizona, USA. 言語形式の焦点化を促す「データ駆動型学習」を取り入れた語彙・文法学習の中学校における実践(西垣知佳子, 吉田壮一, 國兼朝子,中條清美） 平成25年8月11日（2013） 第39回全国英語教育学会北海道研究大会，北星学園大学，発表予稿集, pp. 28-29. Copyright © 2014-2018 Kiyomi Chujo (Nihon University). All rights reserved.